The Industrial Control Handbook has become a standard reference work for practicing engineers-and unlike many reference works it really is used! 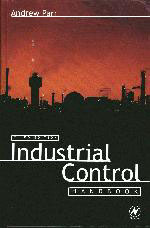 If you are a maintenance engineer trying to solve a problem the Industrial Control Handbook could save you from mental meltdown. Equally, if you want to work out practical solutions without recourse to advanced mathematics this is the book or you. The author writes with the assurance and practical know-how of an engineer who has implemented control systems of high complexity in the challenging environment of an advanced modern steel plant. Theoretical structures and mathematics are strictly part of the engineer’s toolkit-not an end in themselves. Offers a fascinating compendium of engineering wisdom and techniques. This third edition includes new chapters on the increasingly important topic of industrial safety and the emergent subject of mechatronics. Introduction. Temperature. Pressure. Position. Flow. Weighting. Level. Optoelectronics. Velocity and Acceleration. DC Amplifiers. Rotating Machines. Digital Logic. Computers. Communications and Distributed Systems. Closed Loop Control. Hydraulics. Pneumatics. The Man-Made Interface. Maintenance Fault Finding and Safety. Sensors and Transducers. Temperature Sensors. Pressure Transducers. Position Transducers. Flow Transducers. Strain Gauges. Loadcells and Weighing. Level Measurement. Optoelectronics. Velocity. Vibration and Acceleration. Analytical Instrumentation. DC Amplifiers. Rotating Machines and Power Electronics. Digital Circuits. Computers and Industrial Control. Hydraulics. Pneumatics and Process Control Valves. Recording and Display Devices. Closed Loop Control. Distributed Systems. Mechatronics and Intelligent Machines. Maintenance and Fault Finding. Safety. Index.